Thanks for a great post! Very inspiring! What would your most important advice to clinicans and health care orgsnisations be? Thank you Olof, very glad you like it! I think that the most important thing clinicians and healthcare organisations can do is to have the courage to truly engage with patients in new ways. Both healthcare and patients needs to change our attitudes and to be able to do that takes courage and education. It’s great to be talking about this ?. Your piece brings up lots of issues and thoughts such as you mention in your reply to Olaf…..
What I’m thinking about now is how to achieve this in varying contexts. As well as clinicians being responsive and both parties being open to engage all this takes a certain amount of knowledge, courage and confidence by the PwP.. Plus we need a health care system that has the resource people as a part of it to assemble a health care team. Of course some people will have the personal resources to do it alone but I’m thinking most will want/need some kind of support structure if they are advocating for themselves within the institutional structures. If only we already had multi disciplinary teams as the expected norm for PD treatment and oversight. Thank you Dilys, great points! 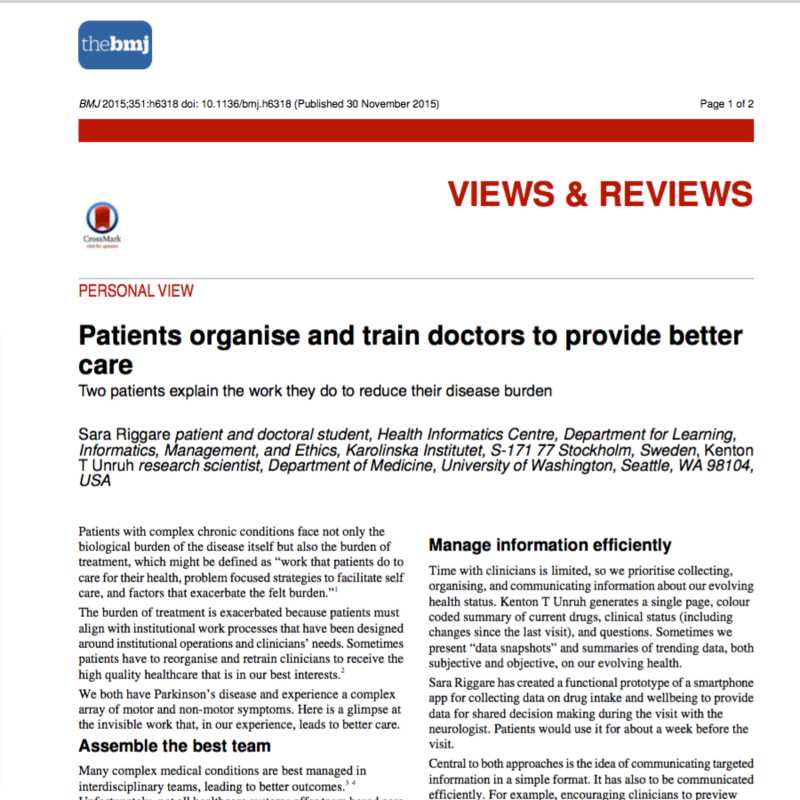 It is indeed a problem that healthcare systems are not organised according to the evidence supporting the team based care approach for many chronic diseases. And we cannot wait until they are, right? My hope and belief is that the ones of us that have the capacity, interest and ability to organise “our” care in the way we think best, will be able to influence the design of care as well as the speed with which change is driven forward. Yes but I’d like at least one of those professionals co-ordinated the rest. With me my GP has retired, my consultant moved away, transferred to new one who went promptly onto maternity leave and is coming back form my next appointment. Oh ye her maternity cover was her old colleague back for two days a month. The only bright side are her research interests but probably would not work with a patient for ‘ethical’ reasons. I feel that my care would be better if someone cared about my care. Oh and my DBS is being undertaken by the specialist hospital 60kms away (and a whole other team). At least that hospital is the hospital that ‘cured’ MS yesterday. Anyway, I’ve got two support workers from two different charities trying for help so I can get some care so I can concentrate on my work.